The METC Institute provides industry-leading GAMSAT preparation courses to Australian, and international students. METC Institute GAMSAT courses emphasise thorough knowledge and understanding of humanities, essay writing, and the sciences along with strategies and practice applying this knowledge. Much like post-graduate Medicine, courses are delivered via multiple media. Depending on your program of choice, courses comprise interactive online modules and exams, live and recorded lectures, and personal tuition. Students can choose between stand-alone courses, or packages & programs which aggregate multiple courses. 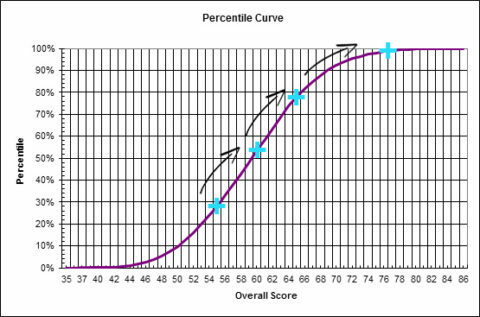 Improve your GAMSAT score by 23 percentile points. Students enrol in GAMSAT preparation courses to learn the knowledge required to perform in GAMSAT, and to develop their ability to apply that knowledge in the context of complex application of critical thinking. METC Institute GAMSAT preparation courses enable the development of intuitive understanding of the concepts required to excel in all sections of GAMSAT and additionally, emphasise critical-thinking and a focus on application of knowledge. This means that students who commenced a METC Institute preparation course with a 55 were on average able to improve to a 60, and those with a 60 were able to improve to 65+. Browse our GAMSAT preparation courses to find out more about improving your score and access free GAMSAT resources. The GAMSAT test is offered twice a year, in March and September. The GAMSAT March 2017 sitting will be held on Saturday 24th March 2018. The GAMSAT September 2018 sitting will be advised in early 2018. Note that GAMSAT is available in Adelaide, Brisbane, Canberra, Darwin, Hobart, Melbourne, Perth, Townsville, and Sydney. GAMSAT sittings are also available in major cities in New Zealand, Ireland and the United Kingdom. Find out more about testing centres. The process of applying for admission to the graduate-entry programs is separate from the process of registering to sit GAMSAT. GEMSAS will process applications for admission to graduate-entry medicine at the GAMSAT Consortium Medical Schools and for the University of Melbourne Dentistry and Optometry programs. The Graduate Australian Medical School Admissions Test (GAMSAT) is developed by the Australian Council for Educational Research (ACER) in conjunction with the Consortium of Graduate Medical Schools to assist in the selection of students to participate in the graduate-entry programs in Australia, Ireland and the UK. It is designed to assess the capacity to undertake high-level intellectual studies in the medical and health professional programs. I am unsure if your courses will get me into medicine. If you are a student who approaches their studies with vigour, and is willing to work hard to achieve your goals then we have good news – you are a great match for our preparation services. Committed students who diligently complete a study program with the METC Institute almost invariably go on to enter medicine. Sometimes this occurs in the first attempt, and other times on a further attempt. In 2016-2017, students who completed a GAMSAT preparation course or program with the METC Institute averaged an increase of 23 percentile points. In other words, if you complete a METC Institute GAMSAT preparation course, you will out-perform 2,000-2,500 more people in the exam then you otherwise would have. Of course, sometimes students work very hard and still miss out on a place in medicine – it is a competitive endeavour. In these cases, we continue to work with students to help them improve, and to realise their goal of entering medicine. I am still unsure if your courses will help me get into medicine. Under each of our courses, read through some of the personal stories and feedback we have received from past and present students. Where available, these can be accessed via the testimonials tab. It is too expensive to enrol in a GAMSAT course/program with the METC Institute. The key to choosing a GAMSAT preparation course or program is to tailor your enrolment to suit your requirements. Once you understand what it is you need, the next step is to choose a quality, comprehensive service. This is what the METC Institute provides. The METC Institute offers intensive, detailed, and comprehensive one-stop resources. Once enrolled in the correct course or program, students will not require any further materials to prepare. Moreover, all student progress is tracked and support is always available. In addition to quality, our GAMSAT courses and program aim to save you time in both the short-term, and the long-term. METC Institute GAMSAT preparation services deliver time savings while you study by teaching you both what to study, and how to study it. In the long-term, we save you time and effort by helping you achieve your best score faster. Finally, it is important to consider the cost of enrolling in the wrong preparation course. For instance, delaying your progression into medicine by a year or two subsequently delays your entry into the medical profession with a resultant downstream impact of hundreds-of-thousands of dollars of lost earnings. In this context, even the most comprehensive preparation programs like the High Achiever Program (course fee $5,997) seems a modest investment. It is too late to start a GAMSAT course or program with the METC Institute. Any course and any program can be started at anytime of the year. Even if GAMSAT is tomorrow. Regardless of the course or program you enrol in, you will not be disadvantaged by enrolling in the course at any specific time. All enrollments are provided with the same resources, and in some cases (such as the High Achiever Program) the study plan is tailor made for you. Even live attendance events are video recorded so that you never miss a learning opportunity. Many students get concerned about trying to fit everything in before the next GAMSAT sitting, however this is contrary to the logical approach of recognising what you need to learn/improve on (your study plan) and going about completing this work. The next GAMSAT may fall before you complete your study plan, but that is fine. You may not be completely prepared, but you will be in a solid position to attempt the exam. The alternative is to attempt an achievable yet diluted study plan from the onset – in our experience this is rarely a good idea. I don’t have a science background, therefore I cannot enrol in a METC Institute GAMSAT course. All METC Institute courses – whether science-related or otherwise – assume no prior knowledge. All students need to do is enrol, and commence working through the course materials. In addition, students from non-science backgrounds are not at a significant disadvantage. GAMSAT requires students possess a deep understanding of fundamental science concepts. These concepts can be learned by anyone, and then it is only a matter of practice. The METC Institute has successfully assisted students with entry into medicine from such diverse backgrounds as theatre studies, journalism, and marketing. My GPA is too low, or I don’t know if my GPA will be competitive. Provided you have a GPA of above 5.0 (on a 7.0 scale), you are eligible to enter all Australian post-graduate medical schools. However, there are implications for how universities use your GPA. Some universities use the GPA criteria as a hurdle: if you have a GPA > 5/7, you are eligible and the actual magnitude of your GPA from this point is irrelevant. For example, if you have a GPA of 5.2 and your friend has a GPA of 6.9, such schools would see you both as equal. Currently, schools that use this method are the University of Queensland, and the University of Sydney. It is these combined scores that are used to rank candidates for interview. In general, to be competitive you should be aiming for a combined score above 155. Given the calculations above, it is also worth considering which type of school favours your GPA. In general, we suggest that those with a GPA in the range of 5.0-6.0 aim for schools that use the GPA criteria as a hurdle. Those with a GPA of > 6.0 will be more competitive in the schools which rank GPA, and in these cases the higher your GPA, the greater your combined score and with it the chance of an interview. It must be stressed however that those with a GPA < 6.0 are still capable of being competitive at a school which ranks GPA, especially where other criteria such as portfolios are involved. I am too old to study medicine. The average age of the Australian medical student lies between 24-27 years of age depending on the school. However, this is just an average. There are many students in their thirties, fourties, and even later. Thus, it really is never too late to follow a career in medicine. I can’t commit to studying. Courses can be scaled up to packages and programs. You can enrol in a single course which covers any or all of Sections I, II, and III, and once you are done with this, you have the option to complete a further course or upgrade to a package or program. This way, you can manage your study commitments without foregoing future opportunities to build on your preparation. I haven’t studied in many years. The METC Institute is aware that this is often true, and so teaches candidates how to study along with what to study. Tutors and administrative staff can assist those without recent study experience in structuring their study program along with how to get back into studying from a long absence. I am too busy to study for GAMSAT. Do you have four hours per week? If so, you have time to study for GAMSAT. Any of our GAMSAT courses can be completed with minimal impingement on your current work, study, or lifestyle commitments. Additionally, all our courses and programs can be commenced at any time, and completed online from anywhere in the world. Even the most intensive programs such as the Platinum or High Achiever Programs have been completed by students studying or working full-time. On average, previously committed students have been able to complete these programs within 6 months while maintaining other full-time commitments. I don’t know if I am smart enough to score well in GAMSAT. Most people have the capacity to perform in GAMSAT and in a medical degree. The challenge for most lies in developing the necessary competencies for success, and then applying these competencies in the performance that is GAMSAT. If you have completed an undergraduate degree with a GPA of > 5.0, you can achieve a competitive score in GAMSAT and enter medicine. From this point, it is a matter of working hard to build proficiency in the domains of GAMSAT and applying your skills in the exam. Contact us and we can arrange a discussion to assist you with your pathway into medicine.